A Saitek clock, one common brand. For some reason, the mention of clocks seems to strike fear into the hearts of many players who haven’t used them before. While they may take a bit of getting used to, their reputation is undeserved and, used appropriately, they enhance the enjoyment of tournament play for everyone. If you haven’t played with a clock before, a couple of trial games beforehand with an experienced player should be enough to pick up the mechanics before you need to use one in anger. Are they like chess clocks? Yes and no… yes in that they put a time limit on each player to get the match completed. No, in that you don’t have a fixed time limit, but an allowance for every move, plus a “time bank” that you can use however you feel like. 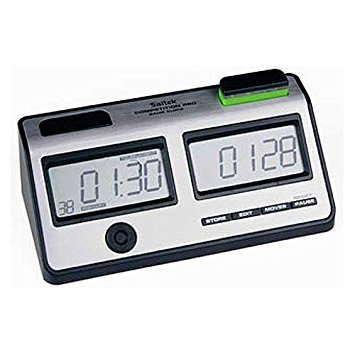 Typically this is 12 seconds per move, plus a time bank of 2 minutes for each point in the match length (so for a 7 point match, your time bank is 14 minutes). Your time bank only starts being eaten away once those initial twelve seconds are up, and all you have to do is make sure it doesn’t fall to 0 before the end of the match. In doubles you get more time, to allow for consulting your partner, and in Speedgammon you get less, to deliberately make dealing with time pressure part of the game. Does it change the game? Not significantly. As far as the mechanics of the game goes, you play with one pair of dice instead of two, and to indicate you’ve finished your move you press the button on your side of the clock and leave the dice on the board. This stops your clock from running and starts your opponents’. 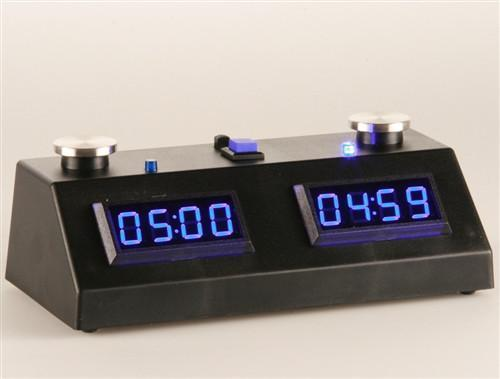 To double, place the cube on the board and press your clock button; to take the double, put the cube on your side and press your clock button. To pass the cube, just press the pause button and you can then reset the board while the clock is stopped. When you get to the end of a game, or have a reason to suspend play (eg. if the dice go on the floor), just press the pause button, and when ready to continue press the button on the appropriate side to start it off again. Most clocks will give a permanent indication if either side gets to 0, so there’s no dispute who ran out first if both players have run out of time before they realise. Am I likely to run out of time and lose matches? No! The clock settings are chosen so that if you keep up a moderate pace, and reserve your thinking time for the harder decisions, you shouldn’t even be close to running out of time. However, if you do run out of time before your opponent does, then irrespective of the match score you lose the match. So what are the benefits of a clock? Using clocks generally means tournaments are more likely to finish on time, which makes venue owners and tournament directors happier! For tournament players, the obvious benefit is that it reduces the number of long drawn-out matches, which means less waiting around between rounds for everyone. Of course some matches may go on a long time because there are no big cubes and therefore many games worth one or two points, some of which might involve lots of moves. Clocks don’t change that, and aren’t intended to. Bear in mind that clocks are not a punishment for slow play – but they do keep things moving at a reasonable pace so as to improve the experience for everyone. Disputes about what numbers were rolled are eliminated. Because the dice are not picked up to signal the end of a player’s turn, they remain down as evidence if either player thinks that an illegal move has been made. If you’ve ever been distracted by your opponent shaking their dice while you have been trying to decide on your move, this cannot happen when a clock is being used. With only one pair of dice in use, your opponent has nothing to rattle! Should I buy a clock? Most tournaments will have a stock available for you to borrow. But if you’re planning on playing a lot of tournaments, it may be a good idea to try a few different ones and get one which suits you. Some have separate buttons, some have a single see-saw-like button, and some are touch-sensitive, and you’ll see various different types in use at most events. Expect to pay around £45-£75 (2018 prices) for a new one depending on which model you choose. Second-hand ones will appear on eBay from time to time and will be significantly cheaper. When will I have to use one? Mandatory – everyone uses them. Preference – if one player asks to use a clock, then one is used. Optional – both players can agree to use a clock, but the default is not to use one. As a rule of thumb, the higher the level of play and the more at stake, the more likely it is to require clocks. Beginners are almost never asked to use them, intermediate events are almost always Clocks Optional. However, intermediate players may be asked to use a clock by the Director if they are starting significantly behind schedule, so being familiar with them is definitely helpful at any level. Most matches streamed online, such as the London Open 2018 final, feature a clock – you can see how simple they are to use by watching for a few minutes. Note also that both John and Tim have many difficult decisions in this hard-fought two-hour match, but brisk play through the easy ones (for them!) means both have a comfortable margin left at the end.